Those of you who visited Deloitte on the LSB Chicago trip heard Jonathan Bauer’s ringing endorsement of a book (“it’s great… based on the first five pages”). The book is Physics of the Future, by Michio Kaku. If the New York Times review is to be believed, the book’s strength lies not in its style, but in the breadth of the information its author summarizes. Mr. Bauer treated us to an hour of entertaining, informative, and memorable comments on the transition from Lawrence to a job, on the consulting world, and the life of a consultant. It’s the third time, and that makes it a tradition: reading period in Spring term means that it’s time for the Lawrence Scholars in Business Chicago trip. Open to all Lawrence students, the trip is sponsored by the LSB program, and made possible by the generosity of Lawrence alumni who open up their board rooms for our students. For two days, 33 Lawrence students got an immersion experience in Chicago’s bustling world of business and finance. At the Chicago Mercantile Exchange, Natalie Garber ’97, Daniel Kolev ’98, and Michael O’Connell ’81 reassured us that a liberal arts education is the perfect foundation for much of what they do at the CME. O’Connell, a Managing Director with broad previous experience in the financial industry, was a biology major at Lawrence, and advised students to take the hard courses and do well in them in order to show both ambition and ability to potential employers. (Not to mention that doing well hard courses has the added benefit of learning a lot.) We had a chance to look at the trading pits, too, to hear the yelling, and to learn the basics of the zany hand-signal language that traders use. and a (connected and convex) table big enough for 35 people. With an amazing view of Lake Michigan and downtown as a backdrop, we had a fascinating, captivating, interesting dialogue with Harry Kraemer. He reminded us that he has very few answers, but many opinions, and then shared many of those opinions with us. On careers: divide a sheet into three columns, write things you enjoy doing in the first, things you would rather avoid in the second, and in the third column, write down occupations that maximize what’s in the first column while minimizing what’s in the second. If this seems simple, that’s because it’s meant to be: Kraemer prefers to make things simple, whenever that’s possible. That is a rare gift, and one we appreciated very much as we listened to him explain, in simple terms, what private equity firms do, how they do it, and what the interesting issues surrounding those activities are. Though Kraemer’s charisma cannot be conveyed in a book, many of his opinions can, and you can read about them here. 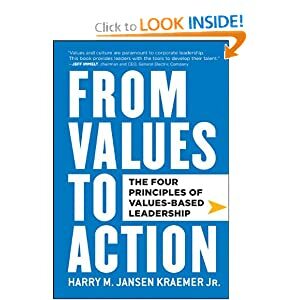 Kraemer generously presented to every one of us a signed copy of his book.